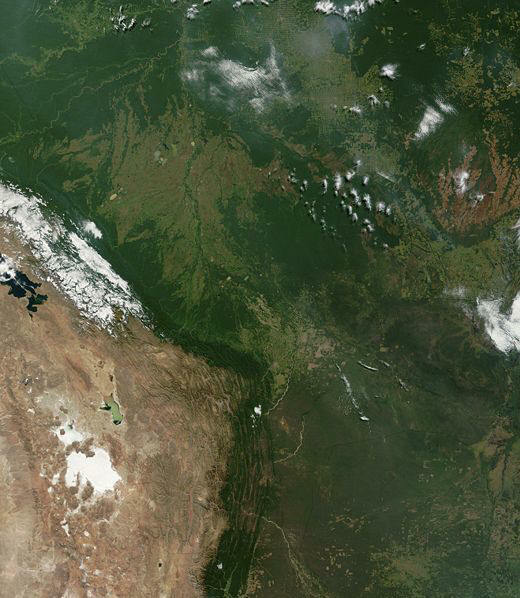 Normally obscured by clouds, Bolivia is amazingly clear in this true-color MODIS image acquired June 20, 2002. Bounded by Brazil to the north and east, Paraguay and Argentina to the south, and Peru and Chile to the west, Bolivia is completely landlocked. A good portion of Bolivia is dominated by the Andes, but it also lays claim to lush forests and pasture lands in the Amazon Basin.Bolivia's agricultural crops include soybeans, coffee, coca, cotton, corn, sugarcane, rice, potatoes, and timber. A number of agricultural plots are visible in central Bolivia. Some large plots are arranged in a circular star shape, with water sources at the center and the agricultural plots radiating outwards. Adjacent to them (down and to the right) are more traditional shaped plots (more rectangular).One of Bolivia's main exports is tropical timber. Visible in this image are areas where the timber has been harvested. The deforestation patterns tend to follow major roads first, then smaller roads adjoining main roads. These patterns resemble the growth of ice crystals and are best viewed in the higher resolutions of this image. Deforestation is visible along the green edge of the Andes in central Bolivia.